Some people have a knack for seeing through the bravado and straight into someone’s souls. This isn’t a skill everyone possesses, but it is certainly one that can be unnerving for those around this person. 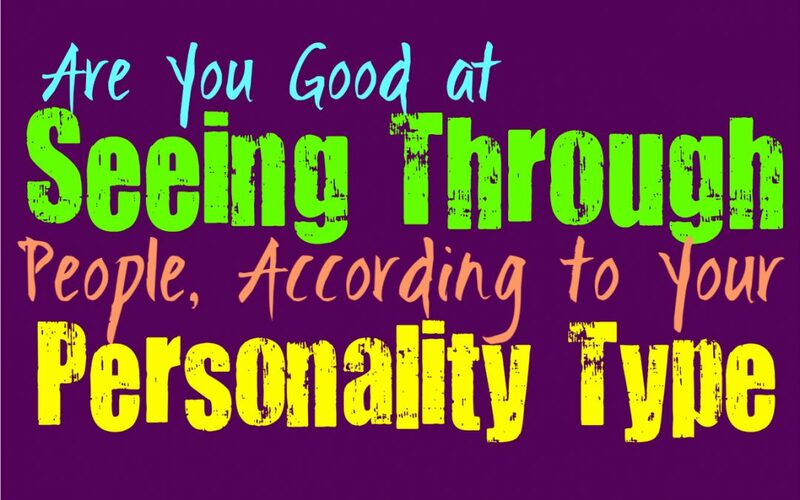 Here is how capable you are of seeing through someone and deep into their souls, based on your personality type. INFJs are absolutely capable of seeing through people and straight into the depth of who they are. While some people might believe whatever bravado others hold up to the world, INFJs can often see beyond that. The more the INFJ begins to trust their own instincts and intuitive abilities, the more they are capable of understanding people and really seeing beyond them. INFJs are complex people who are very connected to people around them, even if this isn’t something that people can outwardly visualize. They have an inner ability to really see beyond what people want them to see, and deep into who they actually are. ENFJs are definitely good at seeing through people and their image, and really understand who they are as a person. The more ENFJs begin to trust their own knowledge and abilities, the better they are at understanding others on a deeper level. They are very connected to those around them and enjoy really diving into the minds and hearts of those they love. For ENFJs it often comes naturally to read people, even beyond what those people want others to understand about them. Because of their connection to the emotions of others, ENFJs are definitely capable of seeing through people. INFPs often base what they believe on their inner emotions and intuition, which can lead them in different directions sometimes. When their emotions see the good in someone, it can cause them to only see that goodness and miss out on the negative aspects of someone. This can definitely mean that INFPs don’t necessarily see through people, especially the people they care for. For them it depends on the distance and connection they feel, since they can often see through people they are not truly close to and already have feelings for. ENFPs are sometimes unpredictable people, and so this can cause them to go back and forth with some things. In some situations where the ENFP isn’t emotionally connected, they are capable of seeing through people and into who they actually are. When they can take a step back and not be emotionally connected to the situation, they can often read people and understand who they are even beyond what they want others to see about them. When they do care for someone already it can be hard for the ENFP to really see through them and into the traits this person might be hiding, simply because they don’t want to see it. INTJs are not emotional people and so they don’t find themselves connecting to people easily on an emotional level. For them it is easier to analyze someone’s behavior and actions, than it is to see through their inner desires and feelings. INTJs are surprisingly capable of seeing through people, but in a much different way than some others types do. For them it is about disconnecting from an emotional connection, and seeing what that person is trying to hide from those around them. They can look at their behaviors and try to read the traits they express without meaning to. ENTJs often try to see through people in a more logical sense, rather than connecting to their emotions. They are good at taking a step back and just paying attention to someone’s behaviors. The struggle is that most people just hear what that person is saying, rather than looking at the behaviors they are attempting to hide. ENTJs are capable of reading these behaviors and seeing through people because of it. They can see the things that really add up in a more logical sense, and this helps them understand the intentions of people a bit better sometimes. INTPs do their best to analyze situations and even people in order to understand the things they might be hiding from those around them. They often believe that they can see through people, and in some instances they certainly can. For the INTP it is better when they aren’t extremely close to someone, since they can look at the situation from a more logical point of view. In these cases they use their minds and their intuition to read a person and see through the image they are portraying to others. Where they might struggle is when someone is close to them and the INTP already has deep feelings for that person, since they find themselves struggling to see beyond that. ENTPs are analytical and intuitive people, and so they often try to use these skills in order to read people. At the same time ENTPs do have more resources they can tap into, and might even be capable of developing their sense of other people’s emotions. The more the ENTP develops these weaker skills, the better they are at seeing through people and into who they truly are. ENTPs will sometimes get an intuitive read on someone right away, and this might get them into trouble in some situations. While others might trust a person, the ENTP can often see what they are hiding from those around them, but their loved ones might not trust their warnings. ISTJs often try to focus on what they see in a realistic sense, rather than trying to see through people or into their emotions. Where the ISTJ will see beyond what someone wants others to see, is simply by paying attention to their actions and what they actually follow through with. They do their best to mind their own business in many situations, and don’t really care to dive into the depths of people they don’t feel a connection or drawing to. ISTJs are more likely to keep people at arm’s length, until they are proven they should let them in. ESTJs are often focused on practicality and getting things done, and sometimes their draw to this can cause them to miss certain details when it comes to people. They aren’t great at connecting to the deeper emotions of others, at least not until they get close to someone. ESTJs just aren’t drawn to inner emotions naturally, and would rather focus on actions and getting things done. They are efficient people who want to work hard to accomplish their goals, and so most of the time they don’t really pay attention to certain details. ISFJs are definitely good at seeing through people, especially someone they are first meeting. They might struggle when it comes to their loved ones, since they only want to see the good and believe in their potential. The fact that ISFJs can so easily see the potential in others, can cause them to overlook the more negative traits they might possess. While they might overlook these things, that doesn’t mean ISFJs are incapable of seeing what is going on. They definitely are good at seeing through people and into their true desires and emotions. ESFJs read people fairly well and are good at connecting with those around them. Their natural ability to understand the emotions and intentions of others, often helps the ESFJ to see through the charade someone might be expressing. They are often very capable of seeing the things people want to hide, since they have a powerful understanding of the emotions and needs of those around them. Sometimes this causes the ESFJ to see the inner potential, but other times it causes them to see the more negative side of someone which they are trying to hide. ISTPs don’t focus as much on people, so sometimes their independence can cause them to overlook certain things. They prefer to pay attention to their own wants and desires in life, instead of constantly sticking their nose into other people’s lives. There are instances where the ISTP can see what someone might be hiding, but this is simply because they have witnessed it before and are focused more on the actions of that person rather than their inner emotions. ESTPs might struggle to really see through people, especially when they are emotionally invested in that person. They are caring people but they focus a lot on living in the present moment and going after what feels right and fulfilling at that time. Sometimes this leaves the ESTP trusting in people simply because that person intrigues or excites them, and this can be to their own detriment at times. They do sometimes see what people are hiding, but only when they aren’t connected to that person. ISFPs focus so much on following their hearts and doing what feels right for them, sometimes this can stand in their way when it comes to seeing through people. ISFPs might not recognize the negative traits someone is hiding, simply because they see the good in them instead. They are connected to follow their own feelings and morals, and would rather not constantly seek out the negativity around them. Instead of trying to see through people, the ISFP will simply give that person a chance to let their true colors shine. ESFPs are emotional and passionate people, but sometimes this causes them to struggle when it comes to seeing through people. ESFPs might not be great at recognizing when someone is hiding things, since they want to take things at face value. They don’t like feeling like they need to constantly analyze people and situations, instead they just want to focus on the present. ESFPs have a lighthearted and warm spirit, which causes them to welcome some people who might not be trustworthy.